Noble Laidies & Gentlemen, Burghers & other honorable Citizens! The Opening of Christmas will be honored by His Majesty's speech while The Olde Militia of Helsinki performs a military exercise and salute shots with musket and cannon according to the reglements of 1752, under the admiring eyes of the Fine Citizens of the Town: after which all participants in historical dress will enjoy a Christmas Lunch. An 18th Century Market will be open to the public from 1 p.m. until 5 p.m. with historical dress items and accoutrements and various reenactor necessities available for purchase. Here you can also get acquainted with 18th century reenacting, 18th century dances, dresses, military uniforms and other outfits and perhaps even arrange to get one for yourself. At 5 p.m. we shall all congregate to spend the evening in the form of a 18th century Christmas Ball according to historical Sweaborg Fortress traditions. The occasion is organized by The Olde Militia of Helsinki and Fine Citizens of the Town and Suomenlinna Fortress. Sweaborg Fortress Historical Christmas Market, 1 p.m. to 5 p.m.
After the Grand Opening we will all gather at the historical Christmas Market at Tenalji von Fersen (300 metres walking distance from the ferry pier). On display will be wonderful replica products, glass, porcelaine, fabrics, eating utensils, candle holders, et cetera, et cetera. in addition to various selection of clothing and other accessories. Föreningen Brage will also bring forward their most beautiful period shoes for both men and women, in addition their authentic collection of clothing, buckles, fabrics, et cetera, et cetera. Also available is a multitude of wool and cotton fabrics, sewing materials in addition to antiques et al. Various historical re-enactors will bring forward their handiwork, clothing, accessories, and other pieces at their flea market tables. What a perfect setting to find that little missing piece to complete your outfit! 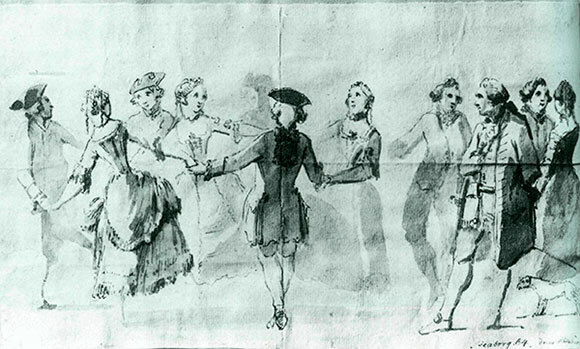 Elias Martin: Dancing guests at a ball in Sweaborg in 1764. As the annals of history tell us: "Sweaborg in the 18th century was not only a military fortress, but also a city that had more inhabitants than Helsinki. The officers families spent their with picnics, dances and masquerades. They read books and listened and played music. Sweaborg also had many amateur theatres and talented military musicians." We have prepared for you this year a traditional Christmas table (smörgåsbord): after which follows various performances, dances and games for your pleasure and enjoyment. 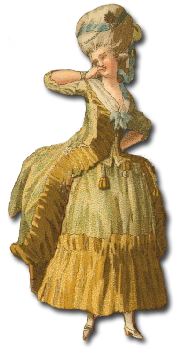 Historical 18th century outfit is compulsory. This is a private occasion for members of H.W.W.C.H.A. and Gustafs Skål. Membership can be applied for at hww.fi. 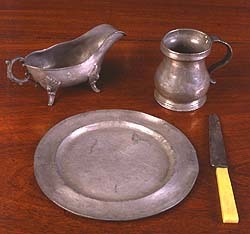 Historically correct Plate & Knife. 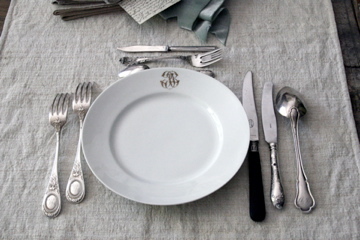 If you can afford it, a modern invention in the form of a Fork. This is a private occasion for members only. Everyone brings their own drinks. Better folk accessorises themselves accordingly, poorer folk use what they can. An historically correct party mood. On the map: 1. Pirunkirkko, 4. Tenalji von Fersen, 5. Myllysali, 7. Ruutikellari, 8. Restaurant Suomenlinnan Panimo, 9. Suomenlinna Kiosk, 10. Store, 11. Restaurant Yläkerho, 12. Cafe Vanille, 17. Restaurant Chapman, 18. Cafe Piper. Walking path map to Pirunkirkko. Walking path map to Tenalj von Fersen. Walking path map to Ruutikellari. The ferry leaves from Market Square at 11:20 which will bring you just on time for the Christmas Grand Opening. If you are only coming for the Christmas Ball the best ferry leaves at 4.40 p.m. Walking distance to Pirunkirkko is about 300 metres (3 min), Tenalj von Fersen 800 metres (11 min), and Ruutikellari 1,1 km (15 min). The last ferries to the "continent" leave at 00.00, 00.40, 1.20 a.m. and 2.00 a.m.
1–5 p.m. — 18th century outfit workshop. Get yourself an 18th century outfit, see real life examples of uniforms, dresses and other accoutrements, learn about 18th century patterns and dress making. Meet a seamstress who can set you up with a complete outfit of your own if you will. 1–5 p.m. — 18th century mousqueteur workshop. Learn everything you want to know of historical reenacting, old style linear war tactics, mousquets, swords, bayonets, black powder shooting, swordmanship and military history. 1:30 p.m. — Chapmans gunsloop presentation for history reenactors. 2:00 p.m. — Chapmans gunsloop presentation for history reenactors. 5 p.m. — 18th century market ends. The Sweaborg Fortress Christmas Opening and 18th Century Market is open to the public at no charge. Sign up until sunday 11th of November 30 € here sign up form. After 15th November participation fee is 40 €. Additional info available from info [at] hww [piste] fi.